Two small silver scrolls, found in Ketef Hinnom on the western side of Jerusalem, and “dated to the mid-seventh century B. C.,” contain parts of Deuteronomy 7:9 and Numbers 6:22-27 on two small silver sheets. (When unrolled the larger is about 1 inch wide by 4 inches long and the smaller is about 1/2 inch wide by 1–1/2 inches long). The significance (in part) of these silver scrolls can be illustrated in the following way. Let us imagine that someone claimed that the Greek historian Herodotus did not write his Histories c. 440 B. C., but that his histories were compiled 1,000 years later by an anonymous person who used sources we will call J, E, D, and P. Advocates of this (imaginary) view would point out that the earliest actual substantial manuscripts of Herodotus date to the 10th-14th centuries A. D. Therefore, they might argue, Herodotus’s Histories were not really written by him c. 440 B. C., but were compiled c. A. D. 560 from the J, E, D, and P sources for Herodotus. However, we have a number of fragments of Herodotus, each of which are papyri that are “fragments of a page,” dating to the 1st-3rd centuries A. D. What is the natural conclusion from the existence of fragmentary papyri of Herodotus that date to the 1st-3rd centuries A. D.? The natural conclusion is that it is impossible to date the composition of Herodotus’s Histories any later than the 1st century A. D., and that perhaps advocates of the JEDP theory of Herodotus ought to consider that the work might just have been written by “Herodotus of Halicarnassus” as it claims. Advocates of the JEDP theory of the Bible argue that the Pentateuch was compiled largely from four alleged source documents—J, E, D, and P—and that these four documents were patched together by an unknown editor or editors “to produce JEDP by about 400 B.C. ; and the Pentateuch in its extant form emerged about 200 B.C.” There are huge numbers of fatal problems to the JEDP theory—such as, for example, that it is utterly contrary to the internal evidence of the books of Moses, that no fragment of J, E, D, or P has ever been found, and that no extant work of history, or any other extant document of any kind, breaths the slightest hint of the existence of these mythical documents until modern times when it was developed by rationalists with a bias against Biblical inspiration. The Ketef Hinnom silver scrolls constitute another extremely difficult problem for opponents of Mosaic authorship and advocates of JEDP. Why are fragments of the Pentateuch extant centuries before it was supposedly created? An advocate of JEDP might reply that Numbers 6:24-26 and Deuteronomy 1:7 existed in some hypothetical source, but the Pentateuch as a whole did not exist. This reply is fraught with the same sort of extremely serious problems plaguing the JEDP theory as a whole. First, Deuteronomy 1:7 was allegedly part of a D document forged in 621 B. C. and falsely ascribed to Moses. But how could the scrolls quote Deuteronomy 1:7 before the alleged D document was created? Second, Numbers 6:21-27 allegedly “formed part of P,” but P was allegedly composed centuries after the date of the silver scrolls. How could the scrolls quote from P if P did not come into existence until centuries later? Third, the presence of both passages in a single scroll indicates that they were viewed as part of a single document—the Pentateuch. 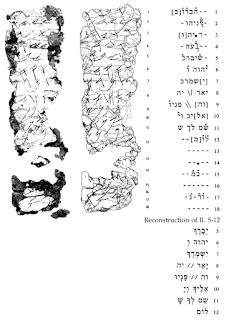 Rather than being the product of hypothetical source documents that have not a scintilla of extant archaeological evidence for them, the Ketef Hinnom silver scrolls are very strong evidence in favor of the claim that the Pentateuch is exactly what it repeatedly and regularly claims—the product of Moses, writing under the inspiration of the one true God, Jehovah, after the exodus of Israel from Egypt. Of course, when the JEDP theory received its classical formulation from Wellhausen in the 1800s when the many archaeological proofs against it did not yet exist. Those who wish to maintain JEDP against the ever-growing tide of archaeological evidence to the contrary might argue that Deuteronomy 1:7 existed, and Numbers 6:24-26 existed, but the book in which they are found—the Pentateuch—did not exist. Such a contrived answer, however, manifests extremely inconsistent historiography. Would the JEDP advocate make the same claim for Herodotus? Would they make it for any other ancient writer for whom we possess small early fragments and much later larger manuscripts? Why are fragments from Herodotus proof that his Histories existed, but fragments from the Pentateuch are not proof that the Pentateuch existed? Furthermore, the Ketef Hinnom silver scrolls validate the existence of predictive prophecy in the Bible. The Pentateuch very plainly predicts the Babylonian exile (e. g., Deuteronomy 28), an event that took place many years after these silver scrolls were made. The scrolls evidence that the Pentateuch existed in the seventh century B. C., and, therefore, that predictive prophecy exists in the Bible, validating Scripture as the Word of God. It may be stated categorically that no archaeological discovery has ever controverted a Biblical reference. Scores of archaeological findings have been made which confirm in clear outline or exact detail historical statements in the Bible. And, by the same token, proper evaluation of Biblical descriptions has often led to amazing discoveries. They form tesserae [tiles] in the vast mosaic of the Bible’s incredibly correct historical memory. The Bible has been confirmed by archaeology over and over again because it is the very Word of God, the revelation of the holy Creator of the Universe who is truth and who cannot lie. Note: we discussed the Ketef Hinnom silver scrolls, and many other things relevant to the preservation of the Bible, in the course on Biblical preservation, manuscript evidence, and Bible texts and versions I have recently been teaching. The first few lectures can be viewed online by clicking here and more are coming. Scroll #2, with drawing and transliteration of ll. 5–12 according to G. Barkay, “The Priestly Benediction on the Ketef Hinnom Plaques,” Cathedra 52 (1989) 37–76 (Heb. ), cited from Emmanuel Tov, Textual Criticism of the Hebrew Bible, 3rd ed. (Minneapolis: Fortress Press, 2012) 383. Nelson Glueck, Rivers in the Desert: A History of the Negev. (New York: W. W. Norton, 1959), 31. 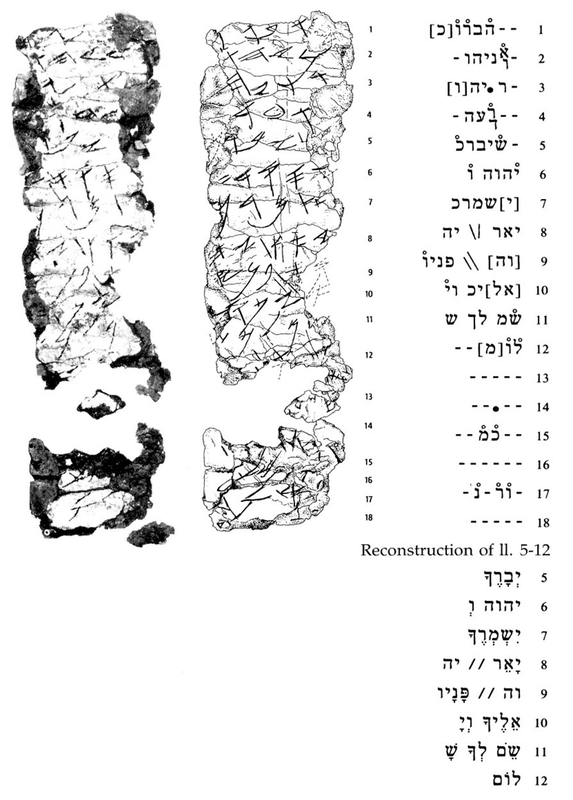 I gather from reading an article online [http://www.biblearchaeology.org/post/2010/01/06/The-Blessing-of-the-Silver-Scrolls.aspx#Article] that this scroll fragment does not contain the Hebrew vowel pointing. Is that correct, & if so, what information does that provide on the argument that the vowel pointings were a part of the original Hebrew text?